This week's mail was inspired by a complete stranger. I received her name and a brief list of things she loved as part of a Secret Santa mail chain. Fun, right? After reading her list, I decided her love for succulents was my inspiration for her gift. 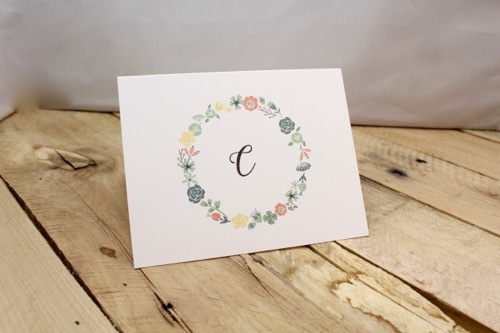 I designed three variations of note cards: monogram, hello and thank you. Each style has a sweet succulent wreath framing the letters. Anyone else keeping singing Adele's song "Hello" each time you reach the cards above? Okay, glad it's not just me. Apologies for the ear worm. p.s. Interested in joining the Secret Santa fun? Contact me via Facebook, email or leave a comment below for the details! Sign up for a our newsletter to get updates on sales and new product lines!